The article reminds us in health care of the Americans with Disabilities Act (ADA) which prohibits all physician's offices (except those operated by religious entities but notes the similar Rehabilitation Act of 1973 covers physician’s offices operated by religious entities) from discriminating against people with disabilities, including those who are deaf. 1. The physician’s office must provide effective communication which meet the patient’s individual needs. 2. The physician’s office must pay for the cost – qualified interpreter, video interpreting service, etc. 3. If there are two equally effective methods or sources, the physician has the right to chose the most cost effective. The caveat here is equally effective for the individual patient. 4. The physician’s office is prohibited from passing along the cost of providing the auxiliary aids/services to the the patient. 5. The ADA does allow physicians to refuse to provide a specific auxiliary aid/service if doing so will create an undue financial burden (significant difficulty or expense). This is hard to prove, as it isn’t as simple as weighing the cost of the service against the payment for the appointment. Examples of auxillary aids and service include 1) qualified interpreter, 2) note takers, 3) open or closed captioning, 4) video interpreting services, and 5) exchange of written notes. 3. Department of Justice ADA Enforcement page 〈http://www.usdoj.gov/crt/ada/enforce.htm〉. Accessed 2/26/12. United States Department of Justice, Washington, DC, 2001. Though I haven’t in the past year, I have made several quilts for QOV (Quilts of Valor). 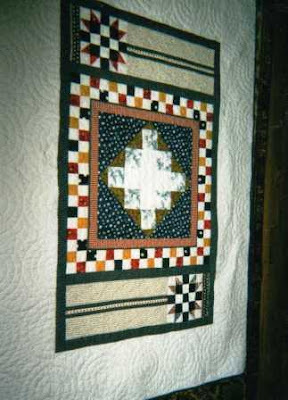 This is one I made starting with an orphan block which I used as a center medallion, then used left over squares to add the border. 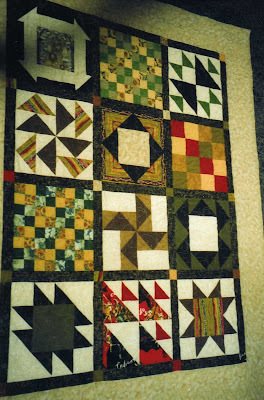 To gain more length, I used two other orphan blocks and strip pieced the added portion. I added a simple white border to increase the overall size. I’m not sure of the overall size, but I think it is in the 50 in X 70 in range. The top was machine pieced, then hand quilted. Sorry the photos are better. This quilt (& photos) are from around 2003 or 2004 (I think). 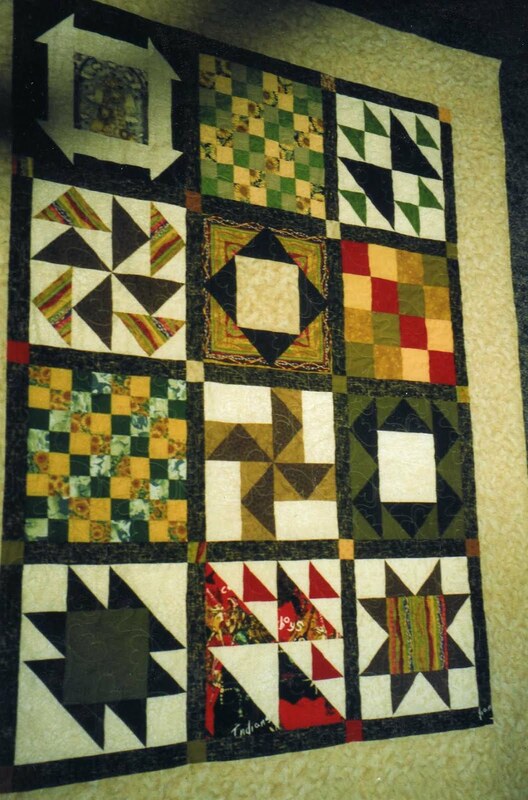 Years ago a friend asked me to make a quilt for his wife for their anniversary. He wanted a queen size. She like frogs and tropical stuff. 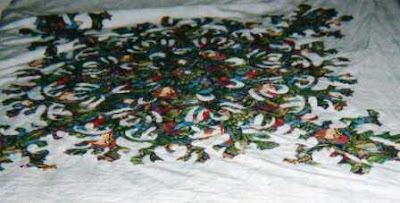 I took on the ambitious project of a Hawaiian appliqué quilt using fabric with frogs, parrots, lizards, etc for the center. The entire appliqué was done by hand and took me almost 6 months. I then had my friend Scottie Brooks to do the hand quilting. I regret that I didn’t get a photo of the finished quilt. 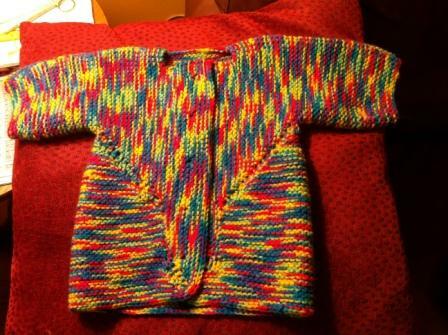 This photo is of the finished top. 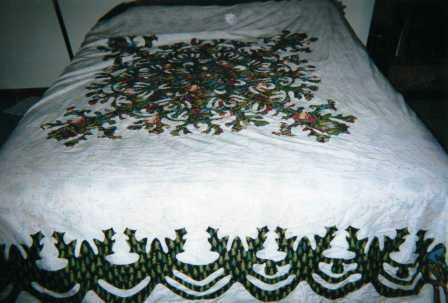 The quit was finished in November 2001 (quilted and bound). It measures 104 in square. I cropped the above photo to try to show more of the detail, but these photos do not do it justice. And while I am still friends with the husband, he and she are no longer together, so I can’t get new and better photos. This injury will never result in an individual qualifying for SSI disability. Not even when it occurs on the side of your dominant hand. That doesn’t mean it isn’t a serious problem and can result in significant shoulder dysfunction and pain. It simply means it will never “meet” an SSI disability listing and will not result in more than a one-arm light RFC (residual functional capacity) rating. The spinal accessary nerve supplies the sternocleidomastoid (SCM) and trapezius muscles. So when the nerve is injured your ability to rotate, tilt, flex your head may be impaired (SCM). Your ability to elevate your shoulder and draw your head back so the face is upward may also be impaired (trapezius muscle involvement). The shoulder may exhibit a winged scapula which may be more apparent or exaggerated on arm abduction. Causes of SAN injury include iatrogenic, traumatic, and neurologic. Most iatrogenic SAN injury occur following diagnostic lymph node biopsies of the posterior triangle of the neck. Injury rates from these procedures are reportedly 3-8%. Functional neck dissections are another source of iatrogenic SAN injury. As with other nerve injuries, if the injury is a transection and is recognized it can be repaired. This may be done immediately or within 3 to 6 months after the injury. If it is uncertain if this nerve was indeed cut or is a closed injury (ie trauma), then close follow-up with serial electrical tests helps determine if surgery will be required. Physical therapy is the mainstay of treatment regardless of whether surgery is indicated. It improves range of motion and encourages a return of strength once contraction occurs. Nerve regeneration can take 3-12 months, during which time physical therapy is performed. Patients with a spinal accessory nerve injury older than 1-2 years may not be a candidate for nerve surgery. So the sooner the injury is recognized and diagnosed, the better. Options for these patients may include tendon/muscle transfer techniques to stabilize the scapula and reduce pain. 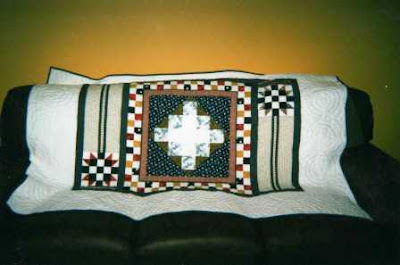 I made this quilt several years ago and gave it to a friend (a nurse anesthetist I worked with at a local surgery center) who was diagnosed with pancreatic cancer. I’m not sure how large it is. I do recall the blocks are 12 in squares and I think the sashing is 2 in wide. So I would estimate it as being 52 in X 66 in. It is machine pieced and quilted. Updated 3/2017--photos and all links (except to my own posts) removed as many no longer active. Dr. Jen Dyer, Endogoddess, is hosting this week’s Grand Rounds. You can read this week’s edition here. I am a total news junkie and always have been (which is probably why I started out college as a journalism major before deciding that I wanted to be a doctor). So, this week's edition of Grand Rounds features the news themes of the prior week and their relationship to health: politics, football fever, the power of facebook, red heart disease awareness, and the impact of pink. ...…. One option, of course, is to give to Planned Parenthood, The other option is to donate to one of the other charities on the front lines in the battle against breast cancer. Komen, after all, is not the only game in town. Here are a few other places where your dollars will be put to good use fighting breast cancer. All of the following groups get high ratings from the American Institute of Philanthroy and/or Charity Navigator-…….. I finally took the time to read some other blogs today. One of the issues that I found disturbing was the case of Amanda Trujillo……………. I’ve tweeted to Amanda to contact me …..
I’ll request the patient’s permission for release of the patient’s medical records from the hospital. …. And I’ll get the name of the surgeon who allegedly does not take the legal doctrine of informed consent too seriously and who allegedly uses temper tantrums as a means to bully people into submission. Maybe we can look into his background a little. If he did have a “tantrum” in a patient care area, has the hospital investigated him for his conduct? Everything will be published here. And if ends up that Amanda was wrong for what she did I’ll publish that as well. In May 1999, Donnie Kanter Winokur, 43, a writer and multimedia producer, and her husband, Rabbi Harvey Winokur, 49, beheld the son of their dreams, the child infertility denied them. ……………..“Sometime after their 3rd birthdays, our wonderful fairy tale of adopting two Russian babies began to show cracks,” said Donnie Winokur,………. For children with autism or behavior disorders, dogs were trained in “behavior disruption.” For children with seizure disorder or diabetes or respiratory issues, dogs were trained to alert the parents at the onset of an episode, and there have been a few able to predict the medical incidents 6 to 24 hours in advance. (How they do this is something of a mystery.)………….. Some of the most promising insights into cancer are coming from pet dogs thanks to emerging studies exploring remarkable biological similarities between man and his best friend. Cancer is the leading cause of death in dogs. Every year, millions of dogs develop lymphomas and malignancies of the bones, blood vessels, skin and breast………………. 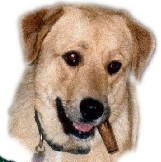 Jack Sevey Jr. created the website MyCancerPet.com in January 2011 after his 5-year-old boxer Bull died from T-cell lymphoma. Sevey wanted to create an online community for fellow owners of cancer-stricken pets and also steer them to helpful resources. Those include lists of clinical trials compiled by several organizations: the AKC Canine Health Foundation, Animal Clinical Investigation, the National Cancer Institute's Center for Cancer Research, the Morris Animal Foundation and the Veterinary Cancer Society…………….. Recently finished this baby jacket for my niece who’s first baby is due this month. Also made her a baby quilt. The pattern is Elizabeth Zimmerman’s Baby Surprise Jacket. 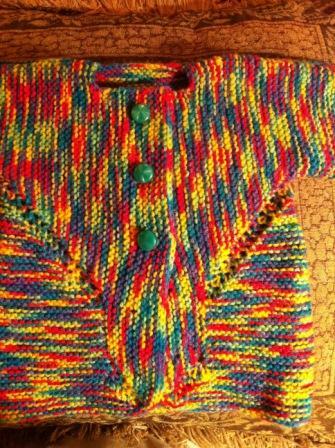 I used Baby Bee Sweet Delight Baby in Crayon Ombre. I found these buttons in my old button jar which worked nicely. 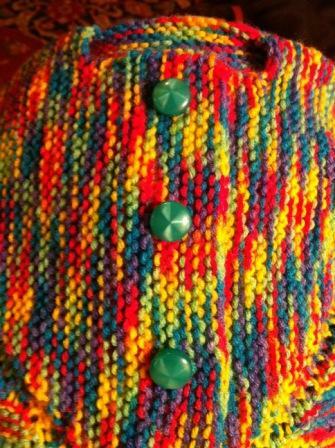 I’ll be making more of these little jackets. I may even try one in the adult size.